This tiny village is located in the interior of the island, set on a plateau surrounded by rocks and enormous boulders. 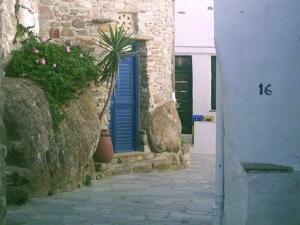 It is one of the most interesting villages to explore, as its architecture is unique on the island. Many of its houses are actually built on top of the boulders! Though tiny in size, the village has two tavernas, a gift shop, a folklore museum, a small stone open-air theater and a few remaining basket weavers still making their sturdy country baskets. Also interesting to view is the tiny Catholic village church next door to the folklore museum. It is exactly what you would expect a village church to look like!